An industrial ecosystem at Äänekoski, Finland concretizes the circular economy with valuable synergies. The industrial ecosystem in Äänekoski, Finland, generates added value by using wood-based and other resources wisely in cooperation with partners. The ecosystem is based on Metsä Group’s operations. Metsä Group’s bioproduct mill will start operations in autumn 2017, replacing the current pulp mill. It will produce pulp, biochemical, renewable energy and sulfuric acid which is a significant step towards closed chemical circulation. Metsä Group’s business partners in the ecosystem will produce product gas, biogas, possibly bio-composites, and fertilisers and earth work materials. Besides these synergies, Metsä Group supplies pulp to the neighbouring paperboard mill. A peeling line at the mill site and a plywood mill 10 km away are under construction. This ensures each part of the tree is used to highest value. 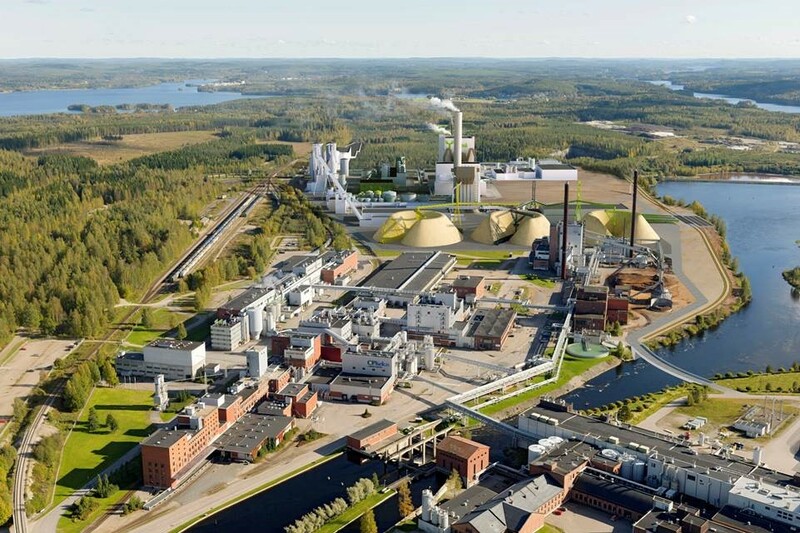 In addition CP Kelco manufactures a viscosity modifier for food and cosmetics (CMC); Specialty Minerals captures CO2 to make , a pigment for paperboard (PCC); Äänevoima energy plant also produces heat and electricity for the town; and Valio dairy plant utilises the surplus heat of the bio-product mill. 1 TWh of renewable electricity for the society, 0.75 TWh for its own operations. 2.5 times higher pulp production under the previous mill’s environmental limit. 50% of process water per tonne. 30% chemical oxygen demand (COD) emissions per tonne. Target to utilise 100% of the sidestreams. 1,500 new jobs in the value chain. Metsä Group produces 14% of Finland’s renewable energy. The bio-product mill increases the share at least by 2%-units. Bark-derived product gas replaces the use of heavy fuel oil. Bio-composites can substitute plastics in electronics and automobile industry. Biogas can be used as a traffic fuel. More closed chemical loop decreases the supply of sulfuric acid. European forest industries are committed to sustainable forest management and offer solutions to global challenges, such as climate change mitigation, population growth and the scarcity of raw materials. To tackle these challenges, we need to use raw materials and resources wisely. Valuable and scarce raw materials must be used resource-efficiently to create added-value materials and products. Renewable energy subsidies may distort competition on the raw material markets. Direct energy use of industrial wood is being promoted at the expense of more sustainable material uses. There are legislative barriers preventing the utilisation of industrial side streams. The current barriers, for example, may prevent transfer of side streams to business partners.